Unquestionably then, Refuge, Lofti Gill’s first poetry collection, is one of drama, danger and cultural challenges. Inevitably too, it’s a page-turner of a story, set in one of the most significant situations of recent world history but it is a tale which, though deeply personal, has universal ramifications. Inter-faith relations, not least those at times of religious upheaval, then revolution, flight, assimilation and the plight of migrants make this rather more than one woman’s memoir. In our troubled world there are, however, many important stories being told, each significant, fired by justifiable rage, sadness, elation, and each with a wholly earned moral thread. Any story, however moving, however much it may contribute to our understanding of our own strange humanity, does not in itself ensure it will be told well. Certainly, a heart-rending truth does not guarantee good poetry. Plenty great causes are served by well-meant, but dreadful verse. A reviewer’s place is to consider the writing’s quality, almost irrespective of the often painful narrative’s extremes. 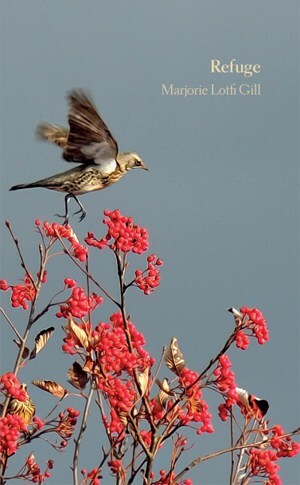 Very happily, however, Marjorie Lofti Gill writes spell-bindingly well, her lines mapping four generations and three continents, her craft worthy of her story. She resists any temptation to over-gloss unfamiliar terms, or to use what ‒ in this case ‒ might have proved intrusive notes. Her verse moves from the conventionally stanzaic, through typographically adventurous and prose poetry to reach its fulfilment in the extraordinary extended coda of ‘Pilgrim’. Designer (and fellow-poet) Eddie Gibbons of Tapsalteerie is to be commended for his fine typesetting, and for his fittingly beautiful cover design. The presentation of Refuge suggests a much more highly-priced volume. Would that all poetry pamphlets were so well-designed. Those fortunate enough to have heard Lofti Gill read will attest to the quiet calm of her reading, which harnesses the sometimes very extreme and powerful imagery conveyed; indeed in print, that very effective, understated quality is also there. Refuge maintains a dignity throughout however harrowing the circumstances. Consider a mother, fleeing with very young children, her fingers ready with rings for anticipated bribes, about to fly outwith radar in a plane solid with people, not all in seats to whatever unknown foreign airport might let them land. In less restrained writing, such riches could easily acquire a tabloid quality. Lofti Gill sustains the clarity of her narrative, but never sinks to sensationalism. I'm the wrong person to ask. This collection, both accessible and layered, comes with its potential gift to migrants, refugees and those of us who ask what our country really needs to do. Marjorie Lofti Gill is exactly the right person to ask.